wind - polar plot functions - waypoint editor - SOLAS compatible - Admiralty data. A very quick and easy to use program, full of invaluable functions. This software uses all the same features as the Planner Plus but with Neptune Outline charts. This program was designed for customers who have plotters but require the course calculation from the Tides, Streams and Wind (GRIBS) etc. This remarkably easy to use software performs course and optimised departure calculations, displaying tidal streams, and reference port tides. The program interface to the GPS and AIS. 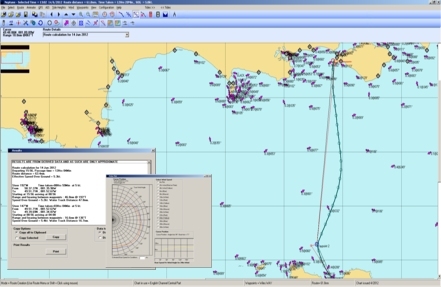 After a calculation the results are readily available on screen the vector plot construction is shown so that navigators can cross check their chartwork. Neptune automatically takes into account the effects of tides using its in built tidal data. If you are interested in the effects of wind the Outline Planner allows you to download GRIB files or manually input wind speed and direction onto the passage plans making it instantly visible if a plan can be sailed for the prevailing conditions. For those interested in boat performance then Polar Plots and boat speed estimation routines for the wind conditions are built into the software. The programs output is easily copied to the clipboard for pasting into the passage plan for SOLAS purposes. Connected to a GPS the programs will act as a plotter and at the same time allow you some very flexible waypoint management between PC and GPS. If you do not connect a GPS to the PC you can plot in manual mode. Waypoint files can be created either by typing in the co-ordinates and names or by simply pointing and clicking with your mouse, you can keep & edit many waypoint files on your PC and call them up at the click of a mouse. Routes can be edited on screen and will show your route animate and show your no sail area. Once a route has been set-up you can use the tide roll function to see the effects of different departure times on the course to steer and the effects of course over ground. 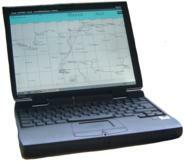 Also the program allows the navigator to view the tidal conditions at each hour of the journey. You can plan into the future or re-visit last years calculations as you wish. There are many features that can be explored. The program is not time limited, and so no yearly updates are required. Included with the programs are demonstration areas, Neptune Planner using outline charts includes the English Channel Central Part. A very versatile, easy to use program, full of great features, calculations and a pleasure to use. System Requirements: Windows XP, Vista, Windows 7 and 8.